As a lawyer, I have recently received from various places, many petitions and requests for help regarding the sentencing of Falun Gong practitioners and the plight [of the practitioners being punished by] re-education through labor. On December 26, my associate and I went to Shijiazhuang City of Hebei Province to offer legal assistance to Huang Wei, who has been subject to so-called re-education through labor. After taking up the case, in the course of dealing with the administrative and judicial authorities, we discovered a series of phenomena that were beyond the imagination of today’s people. These phenomena exist in both the legislative and judicial realms. As an attornery and a citizen of the present era, I feel extraordinarily down-cast and saddened in the face of such incredible phenomena. The first thought that came to me–after I had had negotiations with several courts in Shijiazhuang City–was that I would express such suffocating depression and sadness by submitting a letter as soon as I could to the Standing Committee of the National People’s Congress and its Chairman Wu Bangguo. I did, with only some delay as I spent time and energy trying to decide what exact form the letter should take. In 2003, in my capacity as a citizen of the People’s Republic of China (PRC), I submitted three separate requests–each with the title “Request for Investigation into Constitution Violations”–through registered mail to the Standing Committee of the National People’s Congress. Made on the basis of the Constitution of the PRC (hereafter Constitution) and the Legislation Law of the People’s Republic of China (hereafter Legislation Law), each of the three requests concerns one of the following issues: “Regulations Concerning the Management of Demolition and Relocation of Houses in the City,” the policy of private properties expropriated by the state for generating state income, and the obvious constitution violations by the People’s Supreme Court in interpreting the laws regarding the policy. The three requests were met with the same outcome–no reply whatsoever. This time, after painful consideration, I have decided to write an open letter. Huang Wei, a Shijiazhuang resident with a college education, was sent to a labor camp in 1999 for a 3-year term on the charge of “participating in evil cult activities to undermine the implementation of state laws.” Upon being released, he was only 34 years of age, but half of his hair had become grey. With hope for a good life and through incredible diligence and perseverance, he tried to run a small business and made a promising start. Although he and his family were still rather poor, they were happy and were determined to forget the bitter past and to work for a good life ahead. On April 13, 2004, at 7:30 a.m. Huang took his child to the kindergarten as usual. As he stepped out of the kindergarten to go to work, four unidentified people abducted him. He was taken to the National Security office, where he was thoroughly searched, and all his belongings, including his bike and cash, were taken away from him. Then he was sent to a detention center. All the way along, those who arrested him did not produce any official papers or identify themselves. Later, local authorities got into Huang’s apartment by themselves and conducted a search. Thirty-eight days after Huang had been detained, the police, not wanting to be blamed for detaining someone longer than the law allowed, placed him in a detaining room of the Public Security office for another 15 days, during which time, again, no effort to communicate was made, except for the “questioning and reporting” by two police officers who refused to identify themselves. (When Huang asked them their names and the government department to which they belonged, their answer was, “We are interrogating you, not being interrogated by you.”) Since the report did not reflect in the least the conversation in the questioning, Huang refused to sign it. To Huang’s utter astonishment, however, one of the officers unhurriedly signed Huang’s name on the report right in front of Huang and put his fingerprint on it. Huang later figured out that the purpose of the “questioning and reporting” was to extract evidence for sending him to the labor camp. On June 3, Huang Wei was once again given a 3-year term of re-education through labor. 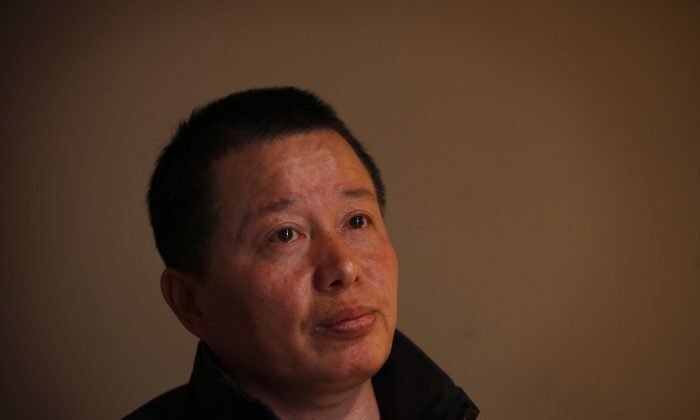 On June 4, leaving his “monitored life” in the detaining room, he was sent to the labor camp a second time. Thereafter, each time Huang demanded the city government to review his case or his rights to due legal process, he had to go on hunger strike before his demand would be met. He was on hunger strike for a total of 42 days. One can imagine how sad and miserable his situation was! In the morning of December 27, 2004, my associate and I arrived at the labor camp in Shijiazhuang City and, following the proper procedure, requested to meet with Huang Wei. The administration of the labor camp told us that they could approve requests for seeing any type of inmates except Falun Gong practitioners and that we would need special approval from the “610 Office” in order to see our client. On the afternoon of December 27, the lawyers  took all the documents of Huang’s complaint about the fact that Shijiazhuang City government had been ignoring his case to the Intermediate Court of Shijiazhuang City. They tried to file the case “The Silence of the Shijiazhuang City government to Huang Wei’s request” but to no avail. At 8:30 a.m. on December 28, the lawyers went to the same court with the same request and were again rejected. In a meeting with a judge at the court’s administrative chamber, the lawyers were told that the case should be brought to the court at Xinhua District. When the lawyers pointed out to him the stipulations by relevant laws, he said the instruction came from “above” and that their job was only to implement them. He suggested the lawyers talk to the judge of the Case Filing Tribunal. At the Case Filing Tribunal, two female staff members looked through the documents and became rather irritated. They told the lawyers that the court would neither accept cases involving Falun Gong nor issue any document with respect to it, adding that there were documents [directing they do so] from above. The lawyers expressed that the court should base its decision about whether to accept a case or not on state laws, and that if there was a conflict between any relevant documents and the laws, then such documents would be invalid. At this point, a young staff member at the scene burst into a near scream, “If you think the documents from above are invalid, you can ask the National People’s Congress to amend the laws.” As she finished, a judge whom she addressed as “the chamber chief” came forward saying, “You are probably not party members (referring to the lawyers) and have not studied the essentials of the Party’s National Congress, have you? After that, there was no explanation from anyone anymore. Asked by the lawyers, another judge said the case should be brought to the court of the Chang’an District. At 10:30 a.m., the lawyers arrived at the third court [that day] and were, again, received by a judge from the administrative chamber. As soon as the lawyers said the case involved Falun Gong, the judge immediately returned the documents that he was reading to the lawyers and told the same story: the instructions from above stipulate that no Falun Gong cases would be considered, no documents would be issued regarding them, and no document justifying [the way it is handled] would be produced. The judge added, “What you lawyers are doing is very risky. If you continue with this, it will be necessary to write a judicial report (demanding disciplinary actions against you. )” That concluded the lawyers’ efforts to file a case at three courts involving two levels in Shijiazhuang City. In handling the case of Huang Wei being sent to a labor camp, I found the following phenomena, which are at odds with the civilization of modern society as well as the rule of law that is advocated, implemented, and sought after by the public. These phenomena are much more prominent in the judicial realm, to such an extent that one feels horrified and in a hopeless situation. As a lawyer and a Chinese, I cannot choose to be silent!